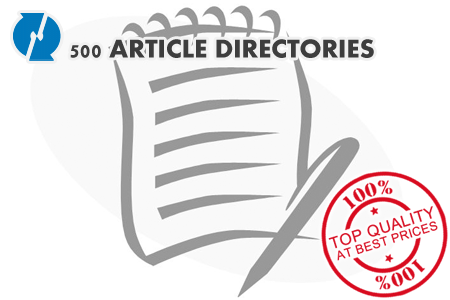 Get 500 Article directories for your website. Article directories are websites that accept articles on various topics for publication at their site and often for distribution at other sites. They are a big step up from once-popular link directories as they include content and not just links. Articles at directory sites are organized by category and include an author box, where authors can include one or more links, depending on the directory. They do not pay for content, but they do typically check for some level of quality. While previously published articles are usually acceptable as long as the submitter has the rights to republish them, copying other people's content is not. A search may be done to make sure that the article hasn't been previously published with a different author's name. The links that can be included in author boxes are good for search engine optimization. You can optimize the articles for your target keywords so that people can get to your sites via the articles and the links in the author boxes as well as by going directly to your site. At the majority of article directories, you can choose your anchor text and include relevant keywords for the links in your author box. The articles can create interest in the topic and drive a more targeted audience to the sites in the author box links. You can use the articles to describe the benefits of your products and services without specifically mentioning them except in your links. If you write a lot of articles that people find useful, you can become known as an expert in your field or niche. Articles can be rewritten to be new articles and published at numerous article directory sites, resulting in more content, more backlinks, and more exposure. When you submit articles to article directories regularly, you have regular new backlinks to your sites.